Disclaimer : As it is the LAW now we have to say if we have been given this product. This product was purchased for use and we have decided to review it with the consent of Janga. There has been no input from them, this review has no hidden agenda and no bias or goal other than honest feedback. A little bit of background: Janga is the brainchild of Nuno Azul, who founded the ‘froth based brand’ in Buarcos, Portugal. A place where the right handers are long and plentiful. Through the years, Janga has grown into an underground movement picking up waystrayers and advocates alike all over the world. The brand exists purely on stoke and in none is this more apparent than Nuno himself. Some might say that Nuno is harder to get hold of than God himself. If he is not answering his phone he will be surfing, talking about surfing or making sure others get to surf. As far as priorities go, we think this is the way things should be. If you would like to know more about the hows and why behind Janga, check this interview we did with Nuno here. 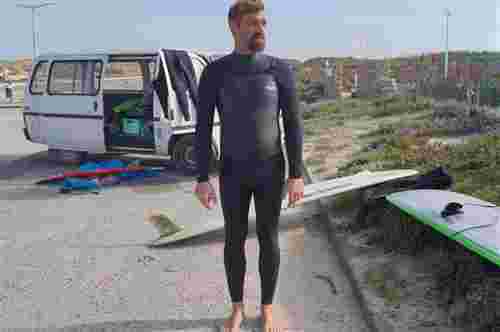 If you want to know what we thought about the latest, greatest Janga wetsuit then I coax and invite you on. Combining all they have learnt about what does work, what didn’t work and what could work, Janga have produced the Gumm Core. An understated (for them) design, which concentrates on features and the best in cuts, seams and neoprene. The whole suit screamed quality, the feel, the smell and the finish. First impressions out of the box. It took just under 24 hours from the moment I placed the order to fumbling open the postage bag with excited hands. To be honest, I was not sure what to expect, I have owned and used Janga suits before and found them to be pretty good but always lacking in some area. It was like they nearly got there but always just ‘nearly’. Let’s just say I was thinking along these lines. This time I was in for a big surprise. The moment my hand touched the neoprene was when I knew that this was going to be a different story altogether. I can only describe it as a cross between butter and silk. It made me want to touch it more, it was very soft and very, very stretchy. This suit felt so flexible, to touch and wear it was like something else. For this section I wanted a wider opinion, I passed around the office here at SB as some of the team have a more colourful past than myself within the wetsuit industry. The general consensus was that it was a well thought out, well constructed and for want of a better word ‘seductive’ suit. They all agreed there had been no corners cut, no expense spared. Extra taped seams, minimum amount of panels and single lining on the full wrap of the torso. The quickdry lining we have come to expect on the inside of the chest and down to the knees. All entry points of the suit, wrists ankles and neck have been triple re-inforced, with a robust YKK chest zip to finish. It felt wrong putting on this suit. So wrong but ooo, so right. It felt akin to slipping on something Lycra that one might use for yoga (if you were to do such things). The experience was that of something that would not protect you from the frigidity of the ocean and certainly not something you should even wear in public. I felt like an old, hairy Wolf from the TV show Gladiators. Wrong and right at the same time if you get my drift. I always think that if you don’t think about the wetsuit during a surf, that means it is doing the job. This thing did not disappoint. Warm, flexible and zero flushing set me up to forget I was testing this thing at all. Big Tick. In the interests of being concise I have tried to keep this part less flowery and more factual. Warmth – For a 3/2 the Gumm Core was on the warm side, I would say that it would keep up with most average 4/3’s and with absolutely zero flushing to date and the windstopper panels doing their thing I will give it for a 8/10 for warmth. Stretch – That is where this thing really shines, I don’t think to date I have tried on a stretchier suit. You might think with the ‘single lining’ windstopper panels that the flexibility would be hindered. Not so. With a sprinkling of Janga genius the boys have created something that should not be. Warm and stretchy. Nuno is the founder and big boss, he is always surrounded by Janga. Quickdry – Is it? Are they? I have never put much stock in this feature as a whole on most suits. People have told me that they notice the difference but I have never found that it really works to the point that I can notice. This part was something of a meeeeh for me. Flushing – As I have said, none, nada, nothing. Extremely impressive. Durability – After a 3 month run of trying to use this as much as possible I have noticed no signs of wear. The suit has got a little looser which you might expect from an ultra stretch suit but nothing that makes any difference to the performance at all. We will continue to keep you updated on this as time goes on. Look and Feel – I can’t say enough good things, it transformed a middle aged, mildly overweight hairy man into… well someone that when caught in the reflection of a car window on the way to surf was to be pleasantly surprised. The feel of the suit inside and out is spectacular. I could but won’t go on. This thing even had room for my winter gut. Stretchy beyond belief. Key Pocket – You might be thinking that I have a review ‘hard on’ for key pockets but seriously. I mean, are they that hard to get right? This is the only real point I can deduct from the silky smooth, super warm stretch-master. It’s in the wrong place for a chest zip (in my opinion) and does not feel like I would want to hang a daisy chain from it. I know it sounds harsh but it’s soooo simple to get right. Price – Coming in at 300 Euros, this suit is neither expensive nor cheap. Is it worth the cash? I would say that if you like the things I have highlighted, if stretch is important then it would be a yes. Deciding to make this part of all the reviews a little clearer, I have decided to ask myself the question. Would I buy another? With that price tag being at 300 Euros, I would be on the fence. There are other suits that are cheaper and these days do I really need to stretch? My limbs don’t stretch and I am not putting myself in positions that I feel I need a mega stretch. However, the look and feel combined with the warmth a zero flushing, it would be that I would feel like there was something missing if I didn’t. Further testing will be done for durability over the coming year. Once you go Gumm, it is hard to contemplate going elsewhere, it’s understated in looks (for Janga) but still a very attractive, well thought out suit that is functional and wantable. Getting to the nitty gritty of what I would give this out of ten, we would go for a 8.5/10. Editor’s Note: After having seen, felt and tried on this suit, a load of the SB crew have ordered some Gumm, stand by for more opinions and nonsense coming soon.